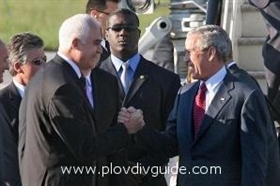 Plovdiv, Bulgaria - Current News - Bush Gets Warm Welcome in Bulgaria, Shakes Hands with People, Troops. Laura Bush with Separate Agenda in Bulgaria's Capital. Bush Gets Warm Welcome in Bulgaria, Shakes Hands with People, Troops. Laura Bush with Separate Agenda in Bulgaria's Capital. US President George Bush, who is in Sofia on the final leg of an eight-day European tour, was officially welcomed Monday morning with a red carpet ceremony on Alexander Nevksy square. Despite the unprecedented security measures, hundreds of Bulgarians gathered on the square in downtown Sofia to see President Bush and his spouse. The people warmly welcomed him, waving flags, and were more than happy when he broke the protocol to approach and shake hands with them. President Bush congratulated also troops, who served in Bulgaria's missions in Iraq and Afghanistan. The national anthems of Bulgaria and the United States and a 21-gun salute were performed in honour of President Bush. He reviewed the guard of honour and laid a wreath at the Monument to the Unknown Soldier. After the ceremony Bush headed for talks with the Bulgarian President and Prime Minister, which are expected to focus on independence for Kosovo, the sitting of a proposed US missile defence system in Europe, the HIV trial of five Bulgarian nurses in Libya and the visa regime for Bulgarians. Bulgaria, a NATO member since April 2004 and EU member since January, 2007, is one of America's new and staunchest post-Cold War allies in Europe. Bulgaria's Foreign Minister Ivaylo Kalfin and Secretary of State Condoleezza Rice signed in April last year the agreement for the location of US military bases on the territory of the Black Sea country. More than 3,000 US troops are due to start arriving at a new base in Bulgaria in September, as part of a US policy to move many of its European forces closer to the Middle East. Bush's tour has taken him to the summit of G8 leaders in Germany, as well as the Czech Republic, Poland, Italy and Albania. Bill Clinton was the first US president to visit Bulgaria, in November 1999.